Nope, not really, don’t count on it, better think twice about that. For many, the romance of owning a business is what motivates their thoughts of being an entrepreneur. Like love is blind, the thought of owning a business and doing what you have a passion for is a powerful aphrodisiac and has lead many people down the road towards disaster. Lay down and rest until the idea goes away. I have seen far more businesses succeed based on doing something other people will love than the other way around. Let me explain. Love is an emotion that takes over and suppresses other parts of the human psyche like common sense and the ability to reason through thoughts and ideas. The euphoric feelings of being in love are the same as the dreams and images one has about being in business for themselves. I know from personal experience. I used to live in a area that within a half mile had over 20 coffee shops. I know because I once counted. Every day while walking my dog I would walk past one coffee shop in particular. This coffee shop was at the far end of the strip and it always appealed to me because the owner would be out in front of his store sweeping the sidewalk and had the most content look on his face. The customers were regulars and they had made this coffee shop a piece of their lives. I soon became a regular and was engulfed in the warmth and comfort of the coffee shop. Thoughts and dreams started to evolve into images of myself as that content coffee shop owner sweeping the walk and serving regulars great coffee in a great atmosphere. Life could not be any better. The more I thought about it, the more I wanted to start my own coffee shop. The vision was astounding. Everything was thought of right down to the pictures on the walls and the name of the cat that would hang out in the front of the house. At least so I thought. Love had blinded me of what I really needed to know about running a coffee shop. Romance overcame reason. . Romance makes you invincible. Your reasons for success are based on the images in your mind. You see thousands of people embracing your product, filling your seats and falling in love with you and your business. You can do no wrong and everything you do is better than the other guy. You start to realize that you want to open a coffee shop. It is a calling; you are consumed with making this happen. Everything you do, say and think revolves around opening a coffee shop. You talk about it with your friends and family. Half of them are excited and their support for you is encouraging. The other half think you are nuts and question your sanity. You never seem to listen to the latter half. At this point I was ready to jump in and open a coffee shop. I had the money to invest. I had the time to devote to the business and I had success written all over my face. However, in hindsight, I was really lucky to get married instead. 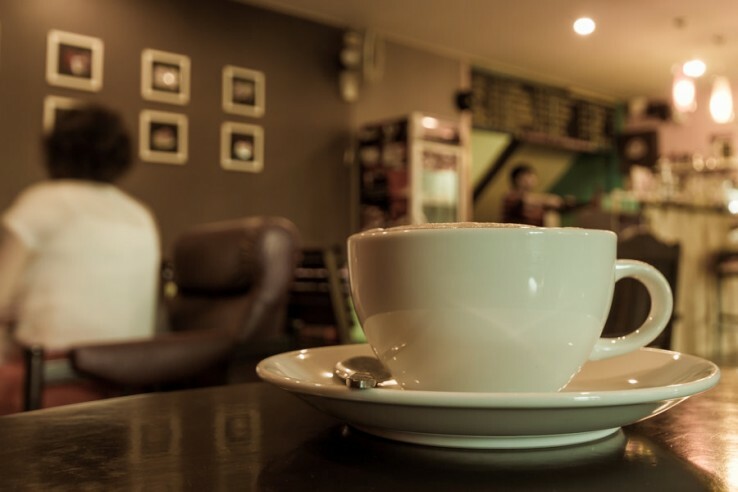 My love affair with owning a coffee shop blinded me to the most important aspects of owning a business. Luckily, my love affair with my partner sidetracked me and my dreams were put on hold. I had been completely focused on the romantic coffee part of the business that I never even thought about running the business. By that I mean I never gave it a thought about how to run a coffee shop as a business. The idea was alive again. We went straight to the internet to research what it would take to open a coffee shop. After three hours of reading, surfing, and bookmarking sites I came away with the thought that I was really glad that the love for my partner was stronger than my love of coffee shops. Love also means having passion. What we learned in three hours of research astounded me. Probably the biggest thing I learned was that passion more than love is needed to own and operate a successful coffee shop. Coffee houses needs on average £20,000 in equipment and inventory to open the doors. This does not include the 2 employees needed for every 20 to 25 seats. Location is key and the need for a drive through, though not required, is an important consideration. Quality of product, menu choices, and employee selection and training all have to be taken into account when opening. Cost of goods and price can make or break a business. Unless you are really lucky, being able to undercut the competition because you think you can often leads to immanent disaster. Coffee houses are very cash intensive businesses. This means that you need to have a large amount of cash in the bank for operating expenses. Basically, you need to have at least three months of operating expenses in your checking account at all times. It takes time to build up your customer base and you can’t expect everyone to patronize your coffee house. It took my wife and I almost three years to plan and open our coffee shop. It was time well spent and we learned something new about the coffee shop business every day. In the end, I still had the love of owning a coffee shop but it was augmented with the knowledge we needed to know about running a business. The combination of love, knowledge and passion is what made our business a success. In retrospect, probably the most important thing I learned in those initial three hours was that Cupid may be an expert in love but he sure doesn’t know how to run a business.